The hot, humid summer now is past. It looks like Fall has come at last. Since cooler temps are here to stay. The nuts are falling down, down, down! Leaves are turning from gold to brown. Checking them first for insects trying to hide. The deck chair cushions will be stored away. We’ll get them out again some warmer day. I enjoy the signs of Fall I’ve found. Reminds me that I like Fall a lot! (c) October 24, 1999, by Johnnie Ann Burgess Gaskill. For permission to use, please contact her. Note: This photo was taken a couple of years after the column was written. This image shows the hands of the potter over those of a young girl. I watched in awe as a skilled potter shaped a blob of clay into a small bowl. As the wheel spun around and around, the potter cupped her hands around the wet, supple clay she’d placed in the center of the wheel. Once the bowl began to take shape, the potter placed her right hand outside the bowl and her left hand inside the bowl. By applying gentle pressure—inside against outside, outside against inside—she used her fingers to create the details she wanted the bowl to have. She got up from her chair, and the boy, who looked to be around 12 years old, sat down. She said, “Press the pedal so you can see how fast the wheel will go.” He did. “Slow it down,” she said. He complied. After he’d cupped his hands around the clay, she squatted beside him and used her hands to help him shape the clay. Teaching often involves more than simply telling and/or showing someone how to do something. So, as the learner struggled to obey her instructions and replicate her actions, she provided additional guidance by actually taking his hands in hers, allowing the gentle pressure from her fingers to guide his. As a result of their working together, the bowl turned out fine. As I reflected on that, I thought about how I’ve often wished I could’ve heard Jesus speak and watched His actions—and had Him come to my aid whenever I’d messed things up. How wonderful, I’ve often thought, to be among those who say, as one of His disciples did, “We have seen him with our own eyes and touched him with our own hands” (1 John 1:1, New Living Translation). Although the “Teacher,” as many called Him, is no longer on earth in bodily form, I am not without a master teacher, and neither are you, dear reader. You see, after Jesus returned to heaven, God sent us another teacher, one Jesus referred to as the Counselor, the Paraclete, the One who comes alongside. (See John 16.) The Spirit guides us as surely as the potter guided the young boy, as surely as Jesus would if we could receive instruction directly from His lips or feel the guiding touch of His hands on ours as we work, as we minister according to His commands. Since we have the Spirit to accurately teach us and to divinely enable us, we can know and do infinitely more than we ever could on our own. Like the young boy who would have made a mess of the bowl (apart from the potter’s presence and patient assistance), you and I will make a mess of our work (of our ministry) if we depend solely on our own abilities. Even the most earnest effort is not sufficient for success—apart from the Spirit’s help—for, as God said centuries ago, “It is not by [mankind’s] might nor by power, but by my Spirit” (Zechariah 4:6, NLT). Copyright © 2005 by Johnnie Ann Burgess Gaskill. For permission to use, please contact her. I don’t know anyone who doesn’t love butterflies, but I can think of a whole lot of folks who don’t get excited about caterpillars—from whence butterflies come! Compared to caterpillars, butterflies are so colorful. And, unlike slow-crawling caterpillars, butterflies flit freely from place to place, making it hard to keep your eyes on them, especially when watching through the tiny viewfinder on a camera, as I did one afternoon. For nearly an hour, I tried to get good photos of those lovely but elusive creatures as they sipped nectar from the blooms on the lantana bushes out by the garden. By the time I’d locate one of the dozen or more butterflies in the viewfinder, compose the shot, and press the shutter button, the butterfly would have fluttered away to a new spot, leaving me with photos of orange lantana blooms—minus the butterflies or, at best, half of one! Only rarely did I get a full, sharply focused, beautifully framed shot of a butterfly. Now, if I’d been trying to take pictures of pokey caterpillars, I’d have had plenty of time to get the perfect shot! But I wanted pictures of butterflies not caterpillars. Why am I so drawn to butterflies? For their beauty, obviously, and for the way they move so freely. I also enjoy butterflies because they remind me that change, dramatic change, is not only possible, but it’s expected. That’s exciting! When I’m looking at a butterfly, I find it hard to believe what it once was. It bears almost no resemblance to its former self, to its former way of life. Only the Creator Himself could make such a change possible. Scientists have a big word for that remarkable change: metamorphosis, which comes from a Greek word meaning “to transform.” Transformation is sometimes subtle--almost imperceptible, actually--as when tadpoles ever so slowly begin to look like the frogs they will one day be. Such slow transformation is certainly amazing; yet it seems less thrilling than the miraculous change that takes place in secret between the time the caterpillar enshrouds itself inside a chrysalis and then emerges days later as a butterfly. How incredible! Imagine the body replacing all of its cells every seven years, getting rid of the old ones, producing new ones, changing constantly in order to remain at peak performance. WOW! Since the Creator designed the body to miraculously renew itself continuously and subtly, surely He intended the mind, soul and spirit to renew regularly, too! After all, the Bible says, “Don’t copy the behavior and customs of this world, but let God transform you into a new person by changing the way you think” (Romans 12:2, New Living Translation, NLT). When you and I start thinking right, we’ll start acting right and talking right, as well. Imagine how we’ll feel when we no longer resemble our old sinful selves. Incredible, huh? © 2005 by Johnnie Ann Burgess Gaskill. For permission to use, please contact her. For a long time, no one dared speak as we looked at the hummingbird sitting stone still in the palm of a woman’s upturned hand. Amazingly, the bird continued to sit there, despite the click, click, click of the cameras in the hands of photographers thrilled to have such an unexpected opportunity to take close-up photos of the tiny bird.Even as we repositioned ourselves to get better shots, the hummingbird remained still, her eyes bright and ever watchful. She appeared calm, despite all she’d been through in the past few minutes. You see, once she’d been flying free in a beautiful flower garden, zooming from flower to flower to sip delicious nectar. But the moment she decided to fly inside a large bird cage in the middle of the garden, she set in motion an unimaginable chain of events. Soon large human hands placed a mesh bag over her. They carried her to a nearby table, where she was gently removed from the bag to be inspected and banded. Information about her was recorded on a sheet of paper and a tiny band was placed around one of her legs. The man who held her then carried her over to a feeder filled with red-colored sugar water and allowed her to drink. All the while, the cameras were click, click, clicking, and the crowd watched with rapt attention. After she’d satisfied her thirst, the man carried her nearer the crowd to give them a better look at her and to answer the many questions they asked about hummingbirds. After several minutes of that, he walked over to the lady who had been selected, by luck of the draw, to release the hummingbird.The man gently placed it in her hand, giving her a once-in-a-lifetime opportunity. “She doesn’t realize she’s free,” the man replied. That was surprising, since the woman wasn’t preventing the bird from flying away. Her palm was cupped slightly, to encourage the bird to remain, but her fingers in no way confined the bird. She was perfectly free to go, perfectly free to live life as the Creator intended. Yet, she sat there, still feeling trapped when, in reality, she was free. As I look at the photos I took of the tiny hummer, these words of Jesus come to mind: “You are truly my disciples if you keep obeying my teachings. And you will know the truth, and the truth will set you free” (John 8:31, 32, New Living Translation, NLT). Since, as Jesus pointed out, every one of us is (or has been) held captive by sin, we need to know—and live in the light of—this wonderful truth He expressed: “So if the Son sets you free, you will indeed be free” (John 8:36, NLT). Since “God has purchased our freedom with his blood [shed on the cross] and has forgiven all our sins” (Colossians 1:14, NLT), we who believe in Him are no longer held captive by our sins. We are free indeed to live a good and godly life—as our Creator intended. ©2007 by Johnnie Ann Burgess Gaskill. To request permission to use, please e-mail her. Additional photos are posted here: http://picasaweb.google.com/johnniegaskill/Hummers. As soon as I read on http://www.betterphoto.com/ that “kindred spirits” was the theme for that month’s photography contest, I began thinking about photos I might take in order to have some that would fit the theme. In previous contests, such as "gold" and "bliss,"I submitted photos I already had on hand. But my supply of “kindred spirits” photos was woefully lacking. 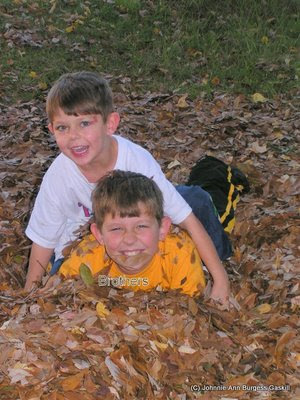 I did find one I’d taken of my two oldest grandsons having a grand time playing in the leaves last year. But that was the only one I thought I could enter. So, while my husband and I were on vacation in Prince Edward Island, Canada, I often said, “Remember, I need a ‘kindred spirits’ photo!” Since he knew what I liked to photograph (churches, flowers, horses, lighthouses, barns, etc.) and was willing to pull over so I could snap such pictures, I encouraged him to help me spot “kindred spirits” photos. 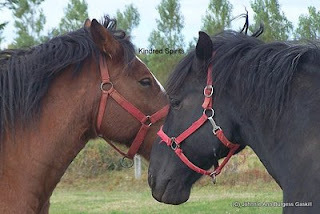 But when James parked near the fence, the horses were too apprehensive to hold their heads close together, as they had been doing when I’d first spotted them. However, they soon relaxed and renewed their focus on each other, so I snapped photo after photo until I finally got one that I was excited about. I didn't know if my photos would receive awards, but having to photograph an abstract concept like “kindred spirits” made me do a lot of thinking. Truly, the relationship between the Father and the Son epitomizes “kindred spirits.” But guess what? Jesus also said, “If anyone loves Me, he will keep My word; and My Father will love him, and We will come to him, and make Our abode with him” (John 14:23, The New American Standard Bible). 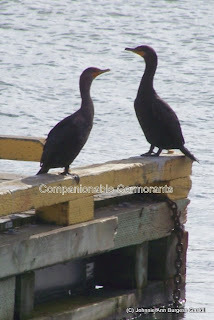 We, too, can become “kindred spirits” with them and with fellow believers! ©2007 by Johnnie Ann Burgess Gaskill. For permission to use, please contact her. One holiday weekend while visiting my mother, I curled up on my bed after she’d gone to sleep and opened a copy of a magazine a friend had shared with me. I found all of the articles helpful, particularly “What the Road Passes By,” written by William Neill, a professional photographer whose images have won numerous awards and been widely published and exhibited. Although my skills as a photographer in no way match his, I sense a kindred spirit with him. Like Neill, I, too, started out by taking “descriptive” photos of places I visited and events I attended, etc. But as I devote more time to photography, a similar kind of thing is happening to me as he said happened to him: “Slowly, as my skills developed as an artist, I found that I was always finding exciting images, no matter how far from home or the road I was on. I began to put less emphasis on how exotic or remote the location was and more emphasis on cultivating the perception to find beauty near at hand, where others would pass it, and then to photograph it uniquely” (Outdoor Photographer, December 2006, p. 58). It’s fairly easy to see and to photograph the beauty that everyone else can see. But more and more frequently I’m looking for beauty in unexpected places, or, as Neill said, in places “the road passes by,” places unnoticed by other passersby. For example, one Saturday afternoon my husband took me to the site of an old mill he remembered seeing many years ago. There, in that remote area, which once upon a time may have been buzzing with activity, I discovered unexpected beauty amid the ruins. So, I snapped picture after picture of the place scarcely noticed by those who drive past, especially those who frequently drive by. Although I have many beautiful photos in my collection, some of my favorite images are those showing the beauty I found in unexpected places. (I’ve posted some of them here: http://picasaweb.google.com/johnniegaskill/BeautyInUnexpectedPlaces02). Discovering such beauty is like waking up on Christmas morning and seeing a stack of gifts that will delight your heart. The ability to see beauty in unexpected places is a God-given gift, I think. But we can develop it if we’ll “train the eye” to look for beauty. One of the best ways to do that is to take lots and lots of pictures, which can now be done cheaply with a digital camera. Once we upload the photos to our computer’s hard drive, we can enjoy the beauty long after the time we took the photos. And if we share them with others via e-mail, web albums, or prints, others can also enjoy the beauty we noticed and photographed. As you can tell, I am passionate about photography! And becoming increasingly able to see beauty, even in unexpected places, truly delights me. And he had. First, he’d undergone all the usual traumas associated with being born. Then all sorts of unexpected problems arose. His white blood count began to rise, indicating an infection somewhere in his tiny body. In order to be able to administer frequent doses of antibiotics to help his body fight off the infection, medical staff inserted an IV needle in his right thumb, where it stayed several days before being relocated to his foot. Medical staff also drew blood from him daily in order to evaluate the effectiveness of the antibiotics. And if all that poking and prodding weren’t enough for the little one to handle, he had some choking/strangling episodes, which led the doctors to conclude he had acid reflux. Treatments for that were added to his daily regimen. Then he developed jaundice, which is fairly common in newborns. To clear up that problem, he was stripped of all clothing and placed in a special bed with fluorescent lights shining on him from above and from below. In order to protect his eyes from the bright lights, he was blindfolded. While all the adults around him were very concerned about him, he seemed to have no worries at all. He simply endured each procedure and then settled down, wonderfully oblivious to the next one awaiting him. Is it possible for adults to relax as that baby did? Possible, yes. Probable, no! We know too much about what’s next, don’t we? And that information makes us even more fearful, especially if we know more pain is in our future. But what if we could just relax and simply trust God to either enable us to face the next hurdle or else spare us from it? After all, we accomplish nothing by dreading what’s ahead, do we? Unless God spares us from it, we will have to go through it—whether or not we are scared to death. It seems much more logical, to me, to say, as David did, “Lord…I don’t concern myself with matters too great or too awesome for me. But I have stilled and quieted myself, just as a small child is quiet with his mother. Yes, like a small child is my soul within me” (Psalm 131:1-2, (New Living Translation). Such childlike faith doesn’t come easily or naturally to us. Therefore, we may have to do as David did and say, “…put your hope in the LORD—now and always” (v.3). In fact, we may need to remind ourselves many times daily to place our hope and our faith in the Lord, especially if we’re fearful of what lies ahead. And whenever worry threatens to erode our faith in God, we may have to simply tell ourselves, "Stop it!” Better yet…hold a baby and notice how he rests so trustingly in our loving arms. As we began the hike to Taggart Lake, the weather was perfect. Sunny. Slightly breezy. Definitely chilly, as the wind swept across snow-capped mountains in Grand Teton National Park. The level trail from the parking area soon became steeper and rockier. But that was no problem. We simply slowed our pace and stepped more carefully over the rocks. We walked across a pedestrian bridge that spanned a thundering creek. We passed a lush pasture where horses were peacefully grazing. We photographed marmots sunning themselves on boulders beside the path. I followed, my trepidation increasing all the while, as, without warning, the weather began to change. By the time we reached the lake, a mixture of rain and frozen precipitation was showering us. “Let’s go—now!” I said. As the sudden storm continued, I pulled my lined and hooded coat more tightly around me, thankful I’d had the good sense to wear it, though until then I’d felt foolish doing so. Initially, I regretted being unable to photograph the placid lake nestled at the foot of the majestic mountains, now veiled by clouds; but my disappointment lifted as I began to notice the unexpected, yet beautiful, delights around me. Soon, I was happily snapping pictures of ice crystals nestled among the needles of pine trees and in the crevices of fallen logs. After fifteen minutes passed, with no sign the storm was abating, we left the bit of shelter the trees had provided and set out on the open path to the parking lot. But within another ten minutes or so, the sunshine returned, causing me to regret having left the lake before photographing it. Although I’d missed (by minutes!) the photos I wanted, I came away from that experience with something far better—an understanding that even when sudden, uninvited “storms” come into our lives, we can either fear them and wish they’d go away or else we can begin to look for things that give us joy and hope. And, as I was reminded, there is something to be savored in every situation. Learning to look for the good will help us weather the storms of life. Perhaps the good we’ll see is a faithful friend who stays beside us during the storm. Perhaps it’s the assurance that “This, too, shall pass.” Perhaps it’s experiencing pockets of peace in the midst of a raging storm. Perhaps it’s the sight of a flower flourishing in a difficult place, reminding us we can do likewise. In every storm of life, we can choose our response. We can fear the discomfort. We can rage against it. We can blame others for the misery we feel. Or we can give thanks for those things that delight us and give us hope. Fall is arriving at her own slow pace. Makes me say, “Oooh!” or just sit and stare. Aaah! Soon these colors will be rich and bold. I like to linger long along my way. Leaving trees and vines barren and alone. Each time I gaze at the Great Creator’s art. © September 14, 2003 by Johnnie Ann Burgess Gaskill. For permission to use, please contact her. Since I love the beauty of sunsets (and sunrises, too! ), I paid particular attention to one of the scenes in a TV documentary. It was an especially lovely one, showing a few palm trees silhouetted against the Pacific Ocean, the horizon, and the darkening sky. But what the narrator said captivated my attention as much as that scene did. A few days after I’d had those thoughts, my attention was again captivated by something similar I heard while listening to an audio clip from Leslie Sansone’s book, Eat Smart, Walk Strong. In the section devoted to eating intentionally, she advocates learning to love food and to savor it, rather than eating mindlessly. Approaching food with reverence and celebration helps us to enjoy it more—and, surprisingly, to eat less. Taking the time to acknowledge something does give it additional honor. I remember, for example, how men used to open car doors for women and hold them open until the ladies were comfortably seated and buckled in. Men did that to show us they respected and cherished us, not because we women weren’t strong enough to open our own doors. Yes, pausing throughout the day to recognize people and things is good–for them and for us. The same is true, only much more so, whenever we “let be and be still, and know—recognize that [God] is God” (Psalm 46:10, Amplified Bible). Copyright 2006 by Johnnie Ann Burgess Gaskill. To request permission to use, please contact her.